110’ - Pappa pops off a deep shot (a shot! a shot!) but it’s well off the mark. 111’ - OOOOf, Acosta drives in a deep FK and Scott heads it clear. Corner. 112’ - SCRUM IN THE BOX and Seattle gets its clear. This is not slowing down. At all. 113’ - Roldan at LB. Ivanschitz at flat-out CDM. Dempsey running box to box. Where are we. 115’ - Akindele crosses in and misses. Another cross. Miss. Another shot. Blocked. Another second. Not dead (barely). No idea how this game will finish, but all that youth and skill means this Dallas team will be fun to watch for awhile. This might be the best goalkeeping performance in #Sounders history all things considered. 117’ - Acosta cross is broken by Zach Scott and then another attack. And then Pappa made a stop. Dizzy. 119’ - Dempsey bowled over in the box! No call! Exclamation points! They should have little energy bar graphics above every player right now. 120’ - FULL TIME. 3-3 AGGREGATE. PENALTIES. That was the most insane 120 minutes of soccer ever and it’s about to get more insane. 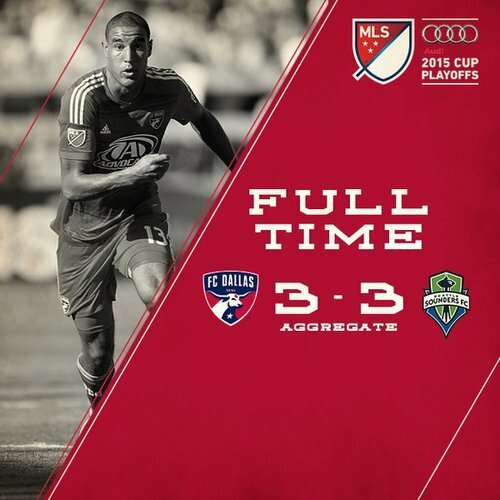 Can we all flip out over a team without Ozzie or Captain Brad Evans somehow holding off that FCD attack for 30 minutes of extra time? FCD is marching into PKs with a 20-year-old. Seattle has Frei. And this game has been so insane I have no idea what to think.